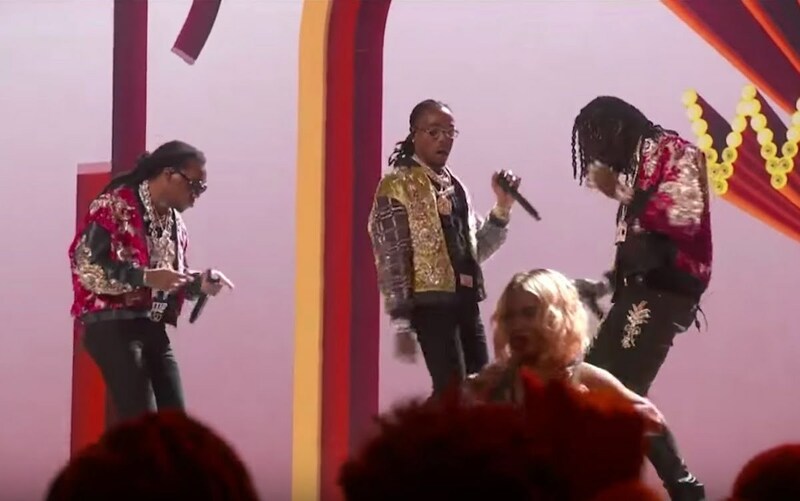 Migos performed their Culture II hit “Walk It Talk” at the BET Awards without their collaborator Drake. Drizzy was not even at the 2018 BET Awards show in Los Angeles; perhaps he is too big for award shows these days. Nevertheless, Migos put on a show for his fans with a medley performance of their hits “Walk It Talk It” and “Stir Fry.” The rap trio from Atlanta also has some celebrating to do after winning Best Group at the BET Awards. Offset gave Cardi B a big shoutout while accepting the award. Cardi is expected to give birth sometime next month to the couple’s first child. Fans will be able to see Migos and Drake perform together on their upcoming joint tour, the “Aubrey and The Three Amigos Tour” which gets underway on July 26 in Salt Lake City. So perhaps you didn’t get to the man from Toronto, and the Three Amigos performed last night, but next month you can catch them in action.